Syracuse Symposium continues its yearlong “Networks” theme with a rare University appearance by social entrepreneurs Sanjit “Bunker” Roy and Meagan Fallone, on Thursday and Friday, April 21-22. Roy is founder and director of the internationally acclaimed Barefoot College in India—the only college built by and for the rural poor. Fallone is CEO of Barefoot College International. The duo also will visit Cornell University on Tuesday, April 19, and the SUNY College of Environmental Science and Forestry (ESF) on Friday, April 22. 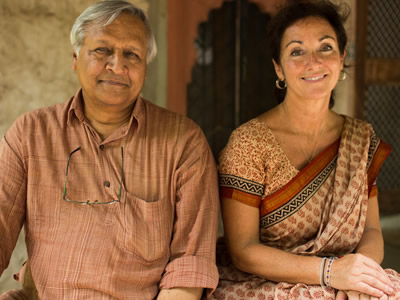 Roy and Fallone’s program is titled “’Barefoot’ Solutions: Networking Rural India and a Global Initiative,” and includes a public lecture on April 21 at 5:30 p.m. in Maxwell Auditorium and a sold-out mini-seminar the following day at 9 a.m. in 341 Eggers Hall. For more information, contact the Syracuse University Humanities Center, based in the College of Arts and Sciences, at 315-443-7192, or visit http://syracusehumanities.org. 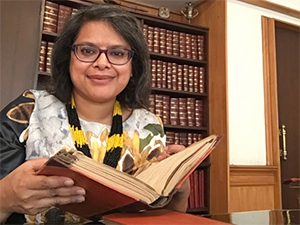 In addition to the Humanities Center, their visit is co-sponsored by the South Asia Center (SAC) in the Moynihan Institute of Global Affairs in the Maxwell School of Citizenship and Public Affairs, the South Asia Program at Cornell and SUNY-ESF. Additional support comes from the College of Arts and Sciences; the School of Architecture; the School of Education; the Whitman School of Management; the Women in Science and Engineering program; the Democratizing Knowledge Collective; The Renée Crown University Honors Program; the David B. Falk College of Sport and Human Dynamics; the departments of Geography and Art & Music Histories; and the Department of Philosophy’s Undergraduate Ethics Program. Ray adds that the program coincides with Earth Day (April 22), during which Roy and Fallone will participate in ESF’s “Moonlighting Discourse Series” with ESF President Quentin Wheeler and Syracuse Philosophy Professor Samuel Gorovitz. The event, which is free and open to the public, begins at 7 p.m. in ESF’s Gateway Center. The duo also will travel to Cornell, where they will discuss “India’s Barefoot College: Women and Community Solar Energy Development” on April 19 at 4:30 p.m. in the G10 Biotechnology Building. The event is free and open to the public. Kevin Rudd, president of the Asia Society Policy Institute in New York City, is likely to attend one of the events. Known for his work in various political, environmental and social arenas, the former Australian prime minister is a Barefoot College patron. She is undoubtedly referring to a handful colleagues at Syracuse and Cornell: May and Gorovitz; Cathryn Newton, dean emerita of A&S, who is Syracuse’s only professor of interdisciplinary sciences and a Provost’s Faculty Fellow; Susan Wadley, the Ford Maxwell Professor of South Asian Studies, professor of anthropology, and director of SAC, all in the Maxwell School; Emera Bridger Wilson, SAC’s associate director and outreach coordinator; Tula Goenka, associate professor of television, radio, and film in the Newhouse School of Public Communications; S.P. Raj, Distinguished Professor of Marketing in the Whitman School; Shobha Bhatia, the Laura J. and L. Douglas Meredith Professor for Teaching Excellence in ECS; Stefania Ianno, an administrator in Syracuse’s art & music histories; and William Phelan, program manager and fellowship coordinator of Cornell’s Mario Einaudi Center for International Studies. Barefoot College empowers communities toward self-sufficiency. Indeed, Roy and Fallone owe a considerable debt to Mahatma Gandhi, whose spirit of service and thoughts on sustainability permeate their work. From solar energy, water, education and health care to rural handicrafts, Barefoot’s “solutions” are unique, as exemplified by the award-winning architecture of Barefoot College itself. “It’s designed and built by villagers for villagers,” Ray says. Using a social justice approach, Barefoot College encourages the rural poor to have a voice in the design and innovation of their own technologies. 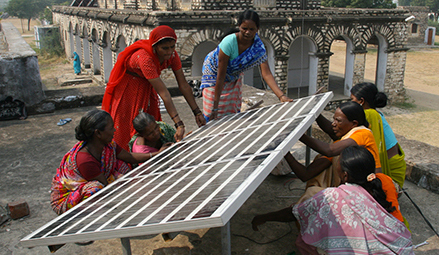 For instance, the college has trained grandmothers from developing countries to be solar engineers, enabling them to bring electricity to their remote villages.